Coming out to the park this summer? We have a few apps to recommend for a fun and safe visit to the Cypress Hills. Want to try your hand at Citizen Science? Download the iNaturalist app and record observations out in nature -- animals, insects, flowers, trees, mushrooms, anything you can find! It's as easy as taking a picture; once you upload the image, the iNaturalist community will help you identify what you found. Everything is geotagged automatically, so you can find out where the best flora and fauna have been seen in the park. Check out the website for more detailed information on different species, and to help others identify what they've found. iNaturalist is available on Android devices, version 4.0.3 and later, and Apple devices (iPhone, iPad, and iPod Touch), iOS 9.0 and later. 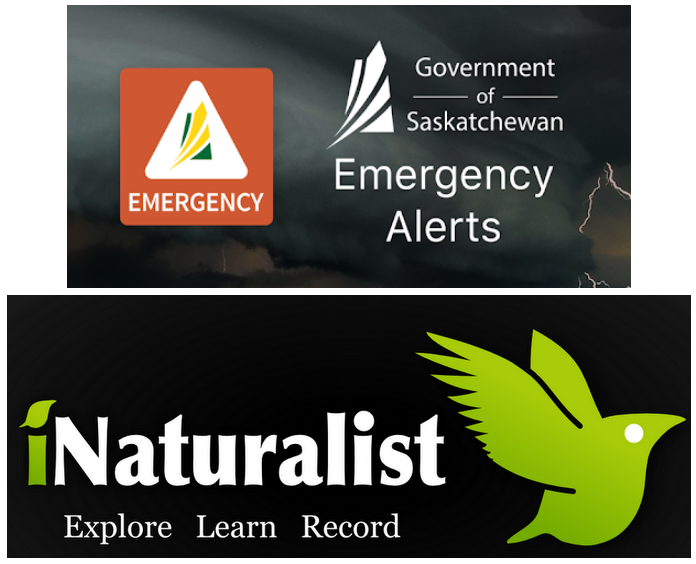 SaskAlert is a new app from the Government of Saskatchewan, in partnership with Environment Canada, Ministries, Crowns and agencies, and local governments to provide emergency alerts in real time about weather and other effects that pose safety concerns. We encourage visitors to download this app as it works in addition to Alert Ready, the national public alerting system -- not all cell phones are able to receive Alert Ready messages due to the age of the device and/or its software. SaskAlert is available on Android devices, version 4.2 or higher, and Apple iPhones, iOS 8.0 and later. We encourage visitors to download these apps at home, before they reach the park. If it's hiking our beautiful trails, taking in our scenic lookouts or just enjoying the peace of the outdoors the season is right to "Fall" in love with Cypress Hills Interprovincial Park. The Johnson Cultural Centre – Artists’ Retreat offers a place to unwind in an idyllic setting where artists can pursue their work, cultivate their creativity in direct contact with nature in a restful and beautiful setting. The Cypress Hills have been the focus for many photographers, painters and sketch artists over the years. The tranquility and unspoiled rugged landscape fosters creativity and enthusiasm. The Johnson Cultural Centre – Artists’ Retreat is open May 1 to Oct 31. We are pleased to welcome our last Artist-in-Residence for Summer 2016 to the Park: Geoff Phillips! The first Artist-in-Residence in Cypress Hills Interprovincial Park (Centre Block), SK, Geoff Phillips will once again be here painting and offering weekend workshops at our Artist's Cabin. Geoff Phillips, born in Lumsden, SK, and now residing in nearby Maple Creek, completed his Bachelor of Fine Arts degree from the University of Regina in 2005. Since then, he has been an artist-in-residence for the Canadian Film Centre's Habitat New Media Lab, and worked independently as a visual artist at the Untitled Art Society and Art Central in Calgary, AB, where he met and married fellow artist Connie (Gibbens) Phillips. For the last five years Geoff has served as Artist-in-Residence for the Cypress Hills Interprovincial Park, SK, where he provides art programming for park visitors and residents of Southwest Saskatchewan. Geoff has also painted large-scale murals for the Southern Alberta Institute of Technology, the town of Lacombe, AB, and the town of Maple Creek's Heritage District. Most recently, a piece from Geoff's Cypress Collection titled "Loch Lomond," painted during his residency in the park, has been acquired by the Saskatchewan Arts Board for their permanent collection and is now hanging in the Legislature Building in Regina, SK. Geoff has also been working on a new series of paintings, called "Plantscapes of the Southwest," which will be featured next fall in a solo show at the Swift Current Art Gallery, Swift Current, SK. Come by the Artist's Cabin Fridays through Sundays in August, 10:00am to 4:00pm, to see Geoff painting and check out some of his work. You can also take in a workshop on painting with acrylics on canvas, held every Saturday and Sunday at 2:00pm.